I've made 77 Dementia Friends. Another session today. My attempts at making ‘Dementia Friends’ are very modest. But my friend Chris Roberts (@mason4233) keeps on emphasising its quality not quantity. I’ve made 77 Dementia Friends thus far. My “dashboard” is very low key, but I am just one very small cog in a giant ‘social movement’. Today I’m giving another information session at BPP Law School. All are welcome, but you do need to sign up in advance if you wish to attend. There are also plans to achieve three million more “dementia friends” in the latest announcement from the Prime Minister about dementia. Some of my slides for today’s information sessions (excluding the activities) are shown below. My first 'Dementia Friends' session is tomorrow. Please sign up. My first @DementiaFriends session is tomorrow. “Dementia Friends” is a national initiative from the Alzheimer’s Society and Public Health England. This session will be 45 minutes only, after which anyone who wishes to have one will receive a ‘Dementia Friends’ badge. One problem though: you must sign up on the Dementia Friends website for you to be able to attend. It’s being held at BPP Law School. With training contract applications deadline coming up (July 31st), you would have thought that this is a great way for commercial or corporate lawyers to be to show that they have an interest in the rest of society? It’s open to anyone, from law student to senior law lecturer. Why do it? There are 800 000 people living with dementia currently in the UK – it is a common set of conditions which affect thinking and behaviour due to diseases of the brain. It’s not a normal part of ageing, and it’s not just about losing your memory. I will try to explain that it’s possible to live well with dementia. It’ll be at 3.45 pm tomorrow (Thursday 24th July 2014). I will notify attendees of the room details very shortly. The sign up sheet is here. I am looking forward to running a number of 45 minute information sessions about dementia at BPP Law School (@BPPLawSchool). They will all start at 3.45 pm. Nine of the sessions will be held in the standard supervision rooms for teaching of law students in the pre-solicitor part of their training before they assume training contracts with law firms. One of the sessions will be in the formidable lecture theatre of the BPP Law School in Holborn, used to lecture law students. I will be running ten sessions between now and March 2015. You can only attend if you sign up on the official Dementia Friends website – I will post the details there soon. 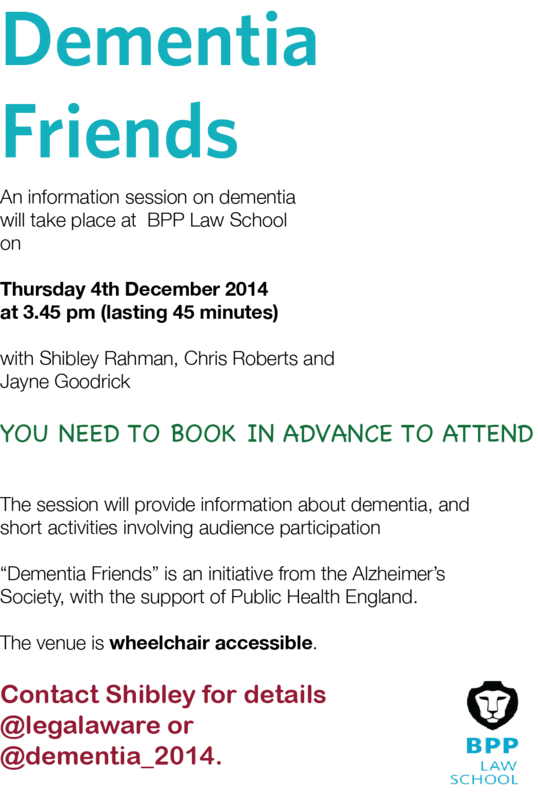 To sign-up, you’ll have to go to a link I will announce in advance on the ‘Dementia Friends’ website. Because of security arrangements at this teaching institution, it will be impossible to turn up uninvited. There will be a sign in sheet you will have to sign if you turn up. The venue will be wheelchair accessible; though please let me know if you have any special mobility arrangements. I can easily be contacted on @legalaware or on @dementia_2014. 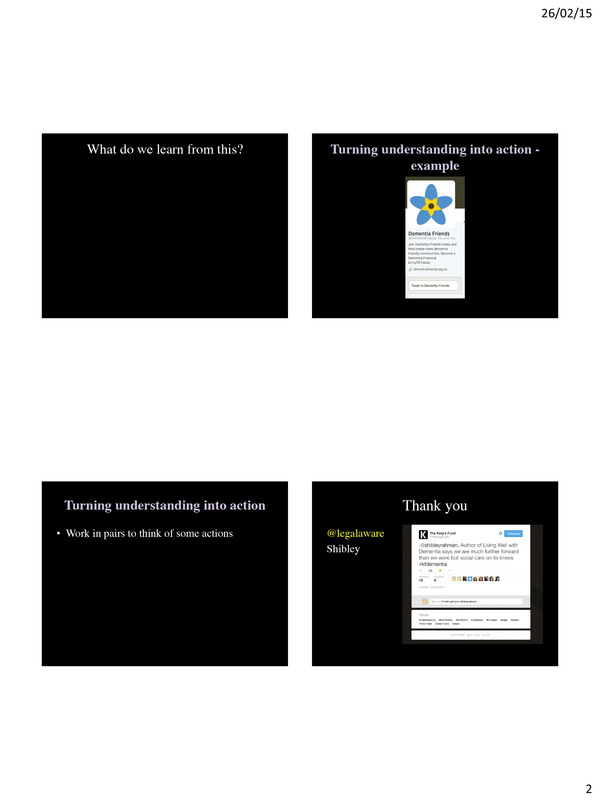 For general information about @dementiafriends you might find following their Twitter timeline useful. 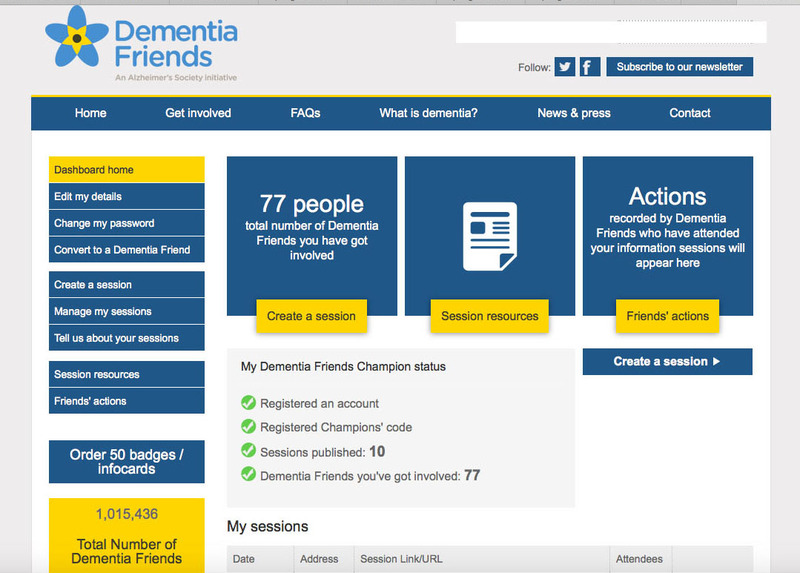 Dementia Friends is an initiative from the Alzheimer’s Society and Public Health England. My sessions will be held at BPP Law School, but these sessions are not to be taken as endorsement of either party by the other. 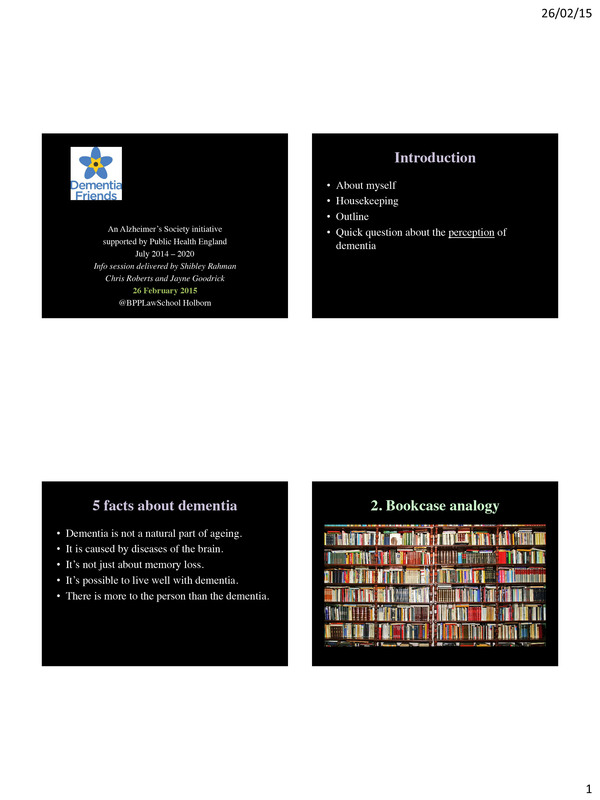 The aim of the session is to introduce you to five basic facts about dementia through some fun interactive exercises. The session on 4th December 2014 – will be held in the giant lecture theatre of BPP Law School Holborn. 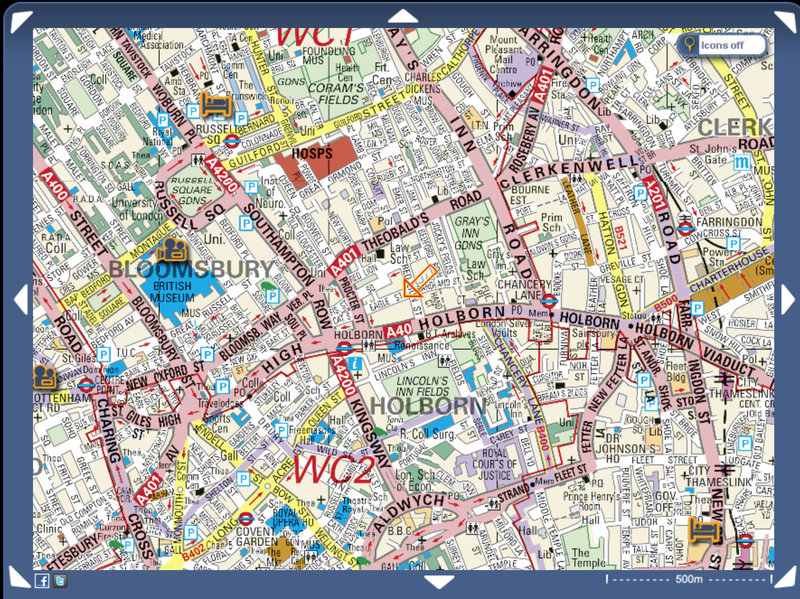 The exact address is: BPP Law School, 68-70 Red Lion Street, London, WC1R 4NY. Tel: 020 7430 2304 Fax: 020 7404 1389. This lecture theatre can host around 100-150 people so this session might be one of the biggest @DementiaFriends sessions ever! "There's more to a person than the dementia". Why personhood matters for future dementia policy. The focus of the National Health Service though, in meeting their ‘efficiency savings’, has somewhat drifted into a ‘Now serving number 43’ approach. 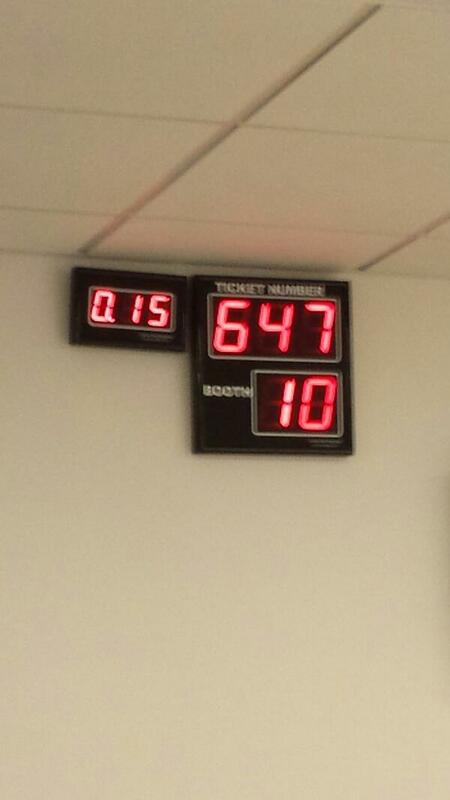 When I went to have a blood test in the NHS earlier this week, I thought I had wandered into a delicatessen by accident. But ‘whole person care’ would represent a fundamental change in direction from a future Government. Kitwood, T. (1997).Dementia reconsidered: the person comes first. Open University Press. This is the plucky group of persons living with dementia at the Alzheimer’s Disease International meeting in Puerto Rico in 2014. That’s right. They’re not there as representatives of any organisation, but there on their own as individuals as members of the “Dementia Action Alliance”. They happen to have received a diagnosis of dementia. 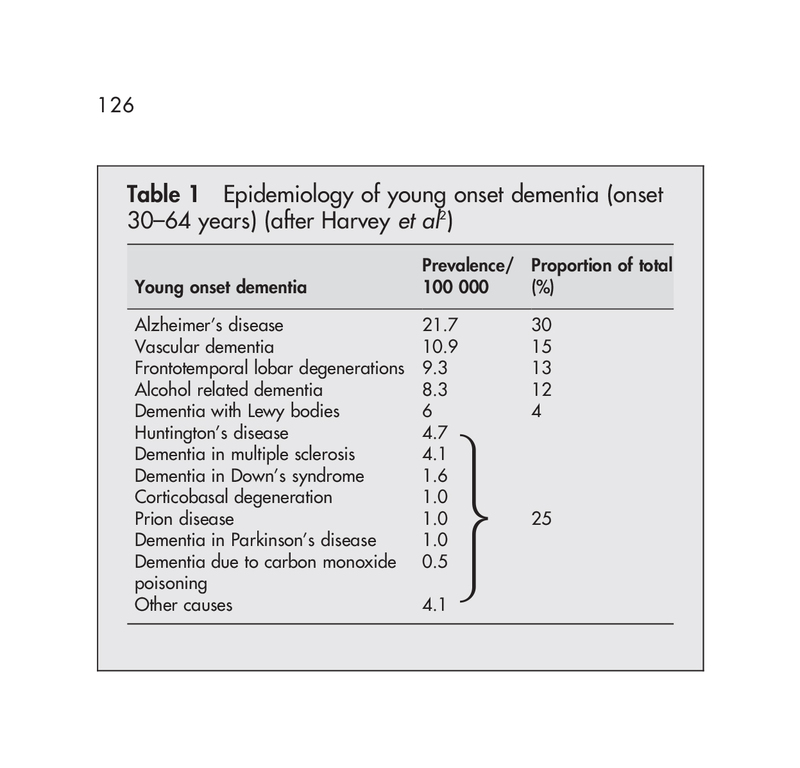 This is Prof John Hodges’ list of the dementias presented in the current Oxford Textbook of Medicine, which is helpful. Victor M, Adams RD, Collins GH (1971) The Wernicke–Korsakoff syndrome. F.A. Davis. Mizutani K, Nishimura K, Ichihara A, Ishigooka J. Dissociative disorder due to Graves’ hyperthyroidism: a case report. 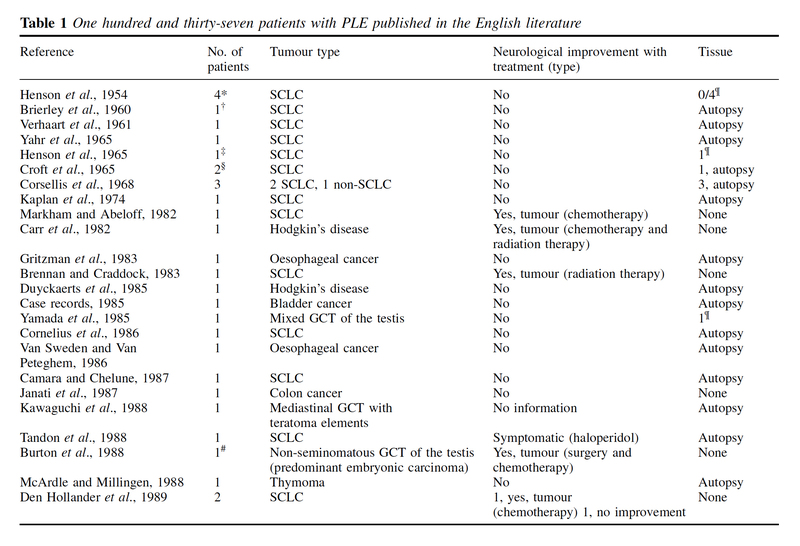 (2014) Gen Hosp Psychiatry, Mar 19. pii: S0163-8343(14)00073-5. doi: 10.1016/j.genhosppsych.2014.03.010. “Dementia Friends” is an initiative run by Public Health England, and delivered by the Alzheimer’s Society. 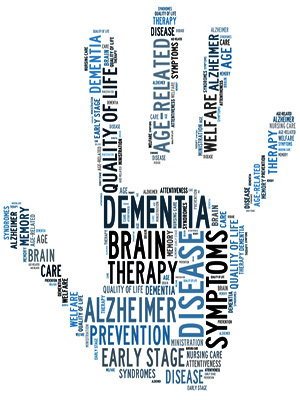 In this series of blogpost, I take an independent look at each of the five core messages of “Dementia Friends” and I try to explain why they are extremely important for raising public awareness of the dementias. Harvey RJ, Rossor MN, Skelton-Robinson M, et al. (1998) Young onset dementia: epidemiology, clinical symptoms, family burden, support and outcome, London: Dementia Research Group, 1998. Schliebs R, Arendt T. (2011) The cholinergic system in aging and neuronal degeneration, Behav Brain Res, Aug 10;221(2):555-63. doi: 10.1016/j.bbr.2010.11.058. Epub 2010 Dec 9. Review. Verity CM, Nicoll A, Will RG, Devereux G, Stellitano L. (2000) Variant Creutzfeldt-Jakob disease in UK children: a national surveillance study. Lancet. 2000 Oct 7;356(9237):1224-7.
WHO. 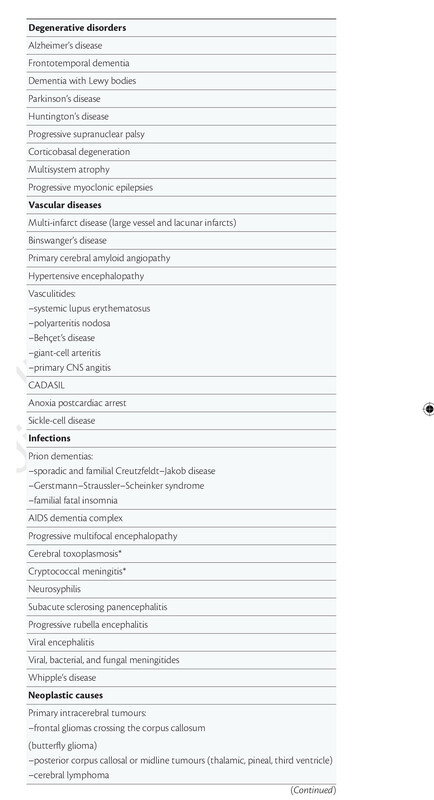 (Revised February 2012) Variant Creutzfeldt-Jakob disease: factsheet no 180, available at http://www.who.int/mediacentre/factsheets/fs180/en/ [accessed 12 June 2014].